There’s nothing that gets Dirk more excited than Star Wars ephemera. A recent bequest to Dirk’s ever-expanding library is Dorling Kindersley’s wonderful Visual Dictionary. After a clear-out of her garage, a colleague’s ex-girlfriend discovered a well-thumbed copyand gave it back to him, and he gave it to Dirk, clearly the memories were too painful. It has been noted here before that the joy of STAR WARS (1977) was the suggestion of a universe that was merely hinted at during the story. Subsequent films and publications have stretched these hints of a mythological cosmos to a wafer-thin gossamer. The Visual Dictionary, gives a name to everything, and by doing so, acts like a butter knife, spreading the material even further; a stunningly photographed butter knife, but a butter knife nonetheless. Sy Snootles has a very inaccurate view of her own potential. As a vocalist she is too weird to make the mainstream. Now that George has finally taken the advice to ‘Put down your camera, and step away from the franchise’ I am going to hold this book in safekeeping for future generations, as it will reveal everything about the Star Wars universe, but tell them nothing. * a RED BALL JET ORGAN, in case you were interested. 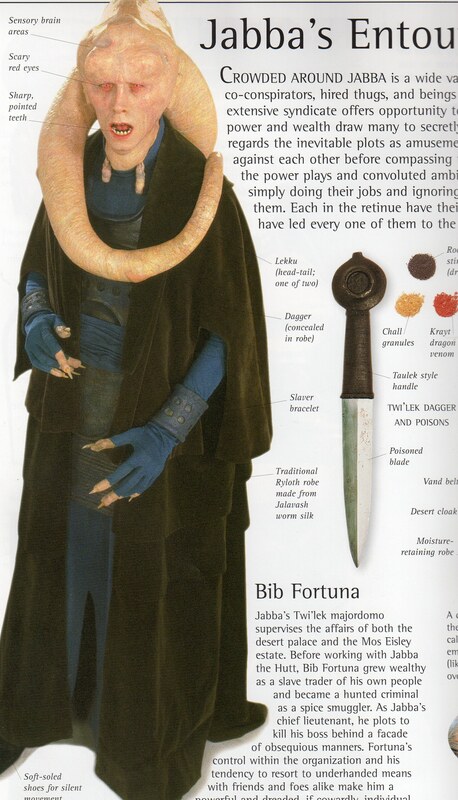 Does Salacious Crumb get his own page? No. A brief mention. I’m afraid that Moff Tarkin gets the same treatment! That is downright disrespectful to Moff Tarkin, I Wicket and his tribe get an entire chapter! Isn’t that the title of Warwick Davis’ autobiography? I mean’t I bet Wicket and his tribe get an entire chapter!